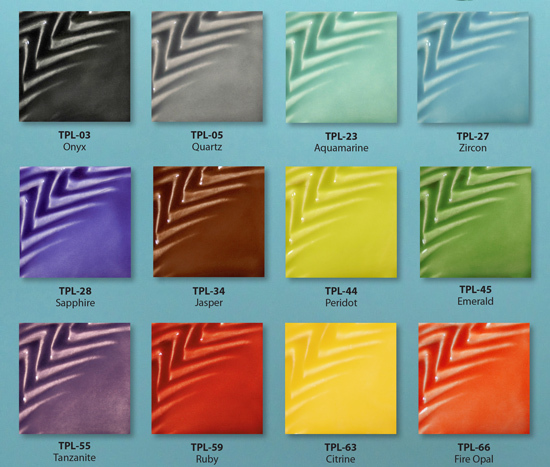 New from Amaco is the Teacher Pallet Light line of 12 classroom-safe, low-fire pottery glazes. This line of glaze colors features bright bold colors but in a semi-translucent formula. These glazes will help highlight texture on your ceramics projects while allowing underglaze paint decoration to show through. These glazes can be blended together to create your own unique colors. All the colors in this series are AP classroom safe and dinnerware safe. (TPL) Teacher's Palette Light AMACO® Teacher's Palette Light® (TPL) liquid gloss glazes are bright, translucent glazes that are the newest edition to the Teacher's Palette® family. The TPL’s are completely intermixable so they can be blended with each other to create an infinite color palette. All 12 glazes are AP certified, LEAD FREE, dinnerware safe, offer brilliant color, and are safe for use by artists of any age. These playful glazes look great over Velvet Underglazes and textured surfaces!